Download your free 66-page guide! The Greeley Company's consultants present at national and regional conferences and seminars throughout each year, serve as subject matter experts for various publications, and author dozens of resources including articles, client case studies, and white papers. 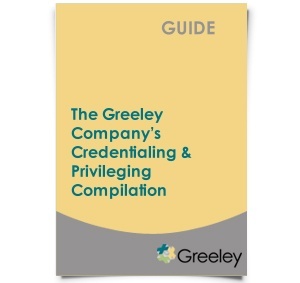 We invite you to download a free copy of our new, 66-page publication, The Greeley Company’s Credentialing & Privileging Compilation: A Selection of Articles, Case Studies, and White Papers. This compilation includes 17 of our most popular resources that share practical advice, ideas, and stories related to credentialing, privileging, and peer review topics. Complete the form on this page to download your free copy of this valuable tool! The Greeley Company has served administrative and clinical teams in more than 700 healthcare organizations within the past three years—including hundreds of credentialing and privileging-related projects. We provide innovative consulting, education, interim staffing, credentialing management solutions, and external peer review to clients nationwide. We are here to help with any credentialing, privileging, or physician-related challenges or needs you might have. Please call 888-749-3054 or email us at info@greeley.com. We welcome the opportunity to discuss any of the resources included in this publication or any questions or topics that you’re thinking about, share stories of clients we’ve helped, or see whether The Greeley Company can be of service to you. Or for more information, visit our website: www.greeley.com.